Who will meet Kerry in the final? 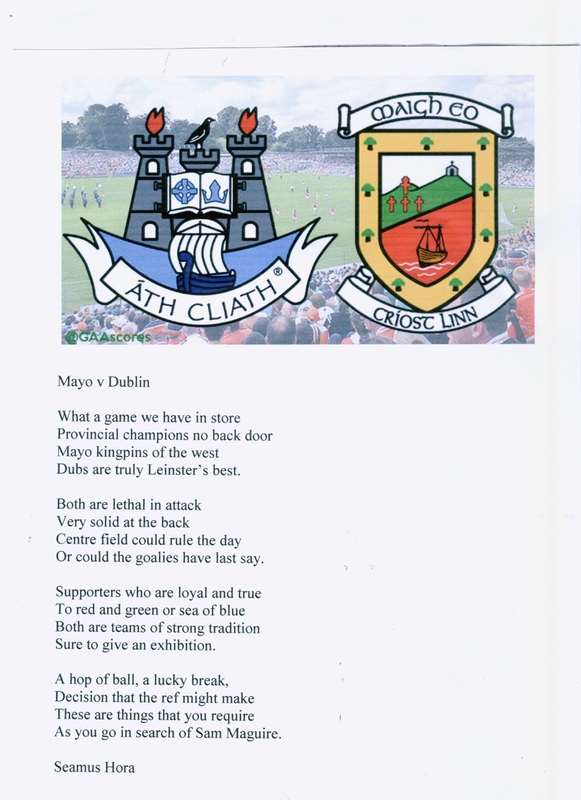 The Mayo-Dublin semi-final match is next Sunday, August 30th @ 3:30pm at Croke Park, Dublin. Categories: Poems from Ireland | Tags: Autumn, Dublin, GAA, Mayo, Seamus Hora | Permalink. Vincent Carmody brings us a moment in history when two seemingly disparate, yet equally impactful events in his life, took place. We take a side trip to Ballybunion for this one. In the latter part of July 1969 my first cousin Eileen McCaffrey (nee Buckley) and husband Brian were down in Listowel from their home in Portmarnock, County Dublin, for a holiday. Being fairly young and carefree we decided to visit the nearby seaside resort of Ballybunion to sample the nightlife. Entering the town we saw large signs announcing that the most famous Irish female singer of the day, Bridie Gallagher, (The Girl from Donegal) was appearing at the Hibernian Ballroom on that night, for one night only. Cousin Eileen, was beside herself with excitement, “we have to go and see Bridie” she said, ‘did you not know that she attended the same primary school in Creeslough, County Donegal, at the same time as Brian’, she told me, ‘although she was in a more senior class’. So after socialising ‘down town’ we made our way back to the Hibernian and the Bridie Gallagher appearance. We got some good seats and enjoyed the singing as the night enfolded, during the performance; Eileen scribbled a note which was taken to the stage, asking that Bridie sing one of her most popular songs ‘Sure their cutting the corn down in Creeslough today’ and dedicate it to an old school friend. Looking down from the stage at the enormous crowd, she said ‘ Ach, Brian, wherever you are in the crowd, don’t leave till we meet up and catch up on old times’. So after the performance we met up and were ushered into the residents lounge. Already in the room was quite a sizeable crowd assembled around two black and white television sets. 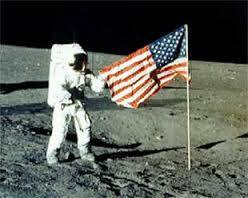 What was being broadcast was the live telecast of the first lunar landing. The date, July 20th/ 21st 1969. So as the century’s most famous moment unfolded and Neil Armstrong uttered the famous words, ‘one giant leap for mankind’ I and the others were in the wonderful company and sharing hospitality with probably one of the most popular Irish artistes of her time, Bridie Gallagher. Categories: Life in Ireland | Tags: Ballybunion, Bridie Gallagher, County Kerry, Dublin, Hibernian Ballroom, Listowel, moon walk, music, Neil Armstrong, The Girl from Donegal, Vincent Carmody | Permalink. Since readers seemed to enjoy my April of Irish Favorites, I thought I would continue with the theme and highlight the things I love about Irish America this month. I see my list of favorite things about Irish America leaning heavily toward the people, places, and things associated with my own Irish American family, but I will also touch on my other favorite Irish American figures, festivals, traditions, arts, restaurants, and more! Sit back this month and enjoy what I love about Irish America! 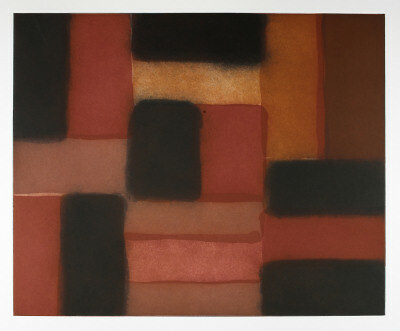 Back in 2008, I fell in love with the work of Dublin-born, American artist Sean Scully. In conjunction with an exhibition of his prints at the Minneapolis Institute of Arts, Mr. Scully presented a talk on the exhibit, his work, and method. It was the only time I have heard an artist speak about what he does and why he does it and it all made sense to me. Click to buy on Amazon.com! I can’t get enough of Mr. Scully’s prints, paintings, and photographs. He published Walls of Aran in 2007. It is a collection of photographs of the stone walls on the Aran Islands. Since reading the book, I have never looked at those walls the same. Mr. Scully has studios in Barcelona, Berlin, and New York, but he is an American citizen, so I am claiming him as my favorite Irish-born American artist. His work simply takes my breath away. I always look forward to what he does next! Categories: Irish American Faves | Tags: Aran Islands, Dublin, MIA, New York, paintings, photography, prints, Sean Scully | Permalink. I love Guinness. Back in the 1990s when I started drinking it, there were only a few bars in the Twin Cities that served a decent pint. Lucky for me, Regan worked at one of them – Molly Malone’s in Minneapolis. I had my first taste of Guinness in Ireland in 1995. It was so, so good. 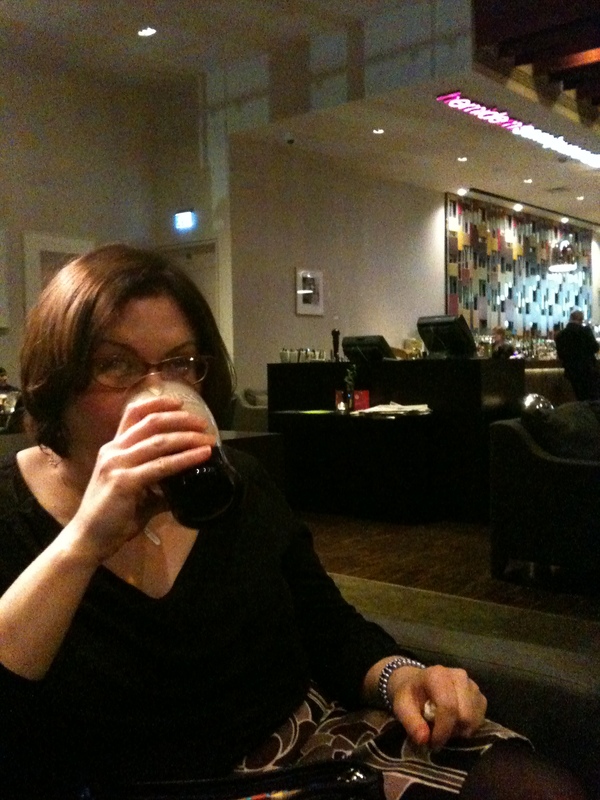 That year we visited the Guinness Storehouse in Dublin, saw the multi-media presentation, learned the fascinating history of the black stuff, and enjoyed our free pints at the end of the tour. 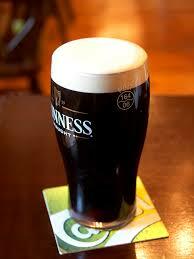 Over the past twenty years, the Guinness at home has improved tremendously as it has grown in popularity. Bars sell more of it so it doesn’t sit around as long. Still, it is tough to beat a pint in Ireland. Categories: Aine's Irish Faves | Tags: Dublin, Guinness, Minneapolis, Molly Malones, Saint Paul, The Liffey, Twin Cities | Permalink. The Gibson is my favorite Dublin hotel. Regan and I stayed at the Gibson last September, and it was the best time I have had in Dublin in years. The Gibson is sleek and modern, with 252 rooms. The bar, restaurant, and reception areas are bright and airy. There is definitely a cool vibe at the Gibson which can be explained by its proximity to the O2 arena. I am not very cool, but they still let me stay there. The Gibson is a great option for staying in Dublin if you are not interested in being right in the heart of it all, but still want to be close enough to make site-seeing convenient. The Luas (Dublin’s tram) stops directly in front of the hotel and gets you to O’Connell Street in about seven minutes. From there, Regan and I grabbed taxis to several of our morning appointments or walked where we wanted to go. Very convenient. Vending machines on each floor – perfect when you need a late-night Bueno bar fix. Fridge in the room – who doesn’t want cold beverages on demand? Large bathroom with a WONDERFUL shower! The shower is really, really great. In fact, it spoiled me for the rest of the trip – no other shower in Ireland measured up. The service was top-notch and professional and the room was immaculate. I will definitely stay at the Gibson next time I am in Dublin. Thanks to Evin (@FreckledPast on Twitter for the recommendation! 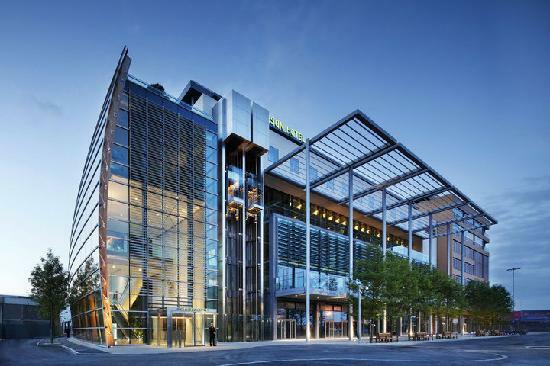 Categories: Aine's Irish Faves | Tags: Dublin, Gibson Hotel, Luas, O'Connell Street | Permalink. If you will be in Dublin next week and are curious about your family history, then you are in luck! 80 million people worldwide claim Irish ancestry – are you one of them? The Irish Family History Centre runs throughout the week of the St. Patrick’s Festival and allows you to discover your Irish family history. Free access to millions of online records from findmypast.ie will give you an insight of what life was like for your ancestors hundreds of years ago in Ireland. Learn how to search for information using the free computers and chat with experienced staff who can answer your questions. We can all use some expert advice when it comes to our family history research. So, if you are headed to Dublin for St. Patrick’s Day, why not stop by the Family History Centre – click here for more information, including map and opening times. Here is a list of the exhibitors at the Family History Centre. For a full list of lectures and exhibitors, please click here. Looks like fun! As if there weren’t enough reasons to visit Dublin this St. Patrick’s Day, here’s another. Hope it is a great success! 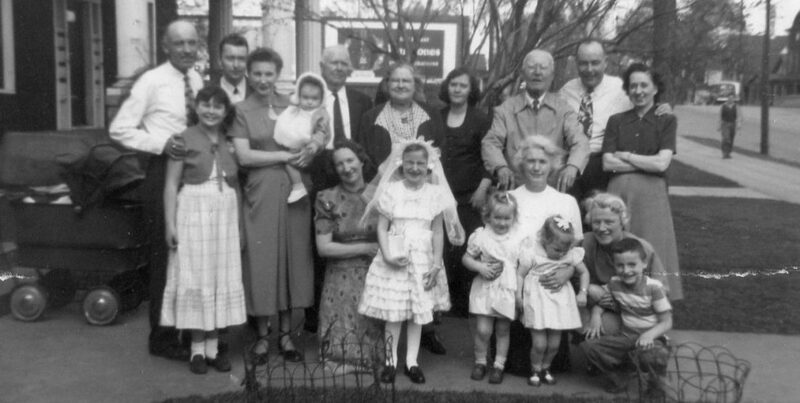 And if you need more help tracing the American branch of your family tree after visiting the Family History Centre, look no further…The Irish in America can help! We have had great success finding American cousins for Irish clients. Check out our Find Your Cousins page for more information – click here! Categories: St. Patrick's Day | Tags: Dublin, family history, FindMyPast.ie, genealogy, research, St. Patrick's Festival | Permalink. We are featuring a few more great Gatherings this week. Whether you are a Tobin, a Coughlan, or a football enthusiast, there’s a Gathering just for you! If you need help planning your trip or your time in Ireland once you get there, we can help. Just visit our Tours page for information. On June 2nd, a gathering of The Tobins of Sheepshead will be held. Everyone with a connection to John Tobin and Mary Spillane, of Caherurlagh, Sheepshead, Kilcrohane, West Cork is invited. John and Mary were married on February 4, 1836. There are a lot of Tobins from Sheepshead, so Danny Tobin (who submitted this listing) would like to give a particular shout-out to the Malllory Tobins. Several of the Mallory Tobins made the journey to America over the years, and Danny is looking for any of the American branch to get in touch with him. So, if you think you might be descended from the Tobins of Sheepshead, County Cork, let us know you are out there! Calling all descendants of Daniel Coughlan and Bridget Reilly who were married on the February 11, 1870 in Ballydehob North, West Cork! On August 4th is the gathering of the Coughlans of Ballydehob. There is already a large group of descendants from the East Coast of America planning to attend, and Danny is hoping that some family from the West Coast will make the trip as well. Categories: The Gathering 2013 | Tags: Ballydehob, Coughlan, Dublin, football, Irish World Cup, Kilcrohane, Mallory Tobins, Sheepshead, soccer, Spillane, The Gathering 2013, Tobin, West Cork | Permalink.